Well, ya can’t walk to the islands, you gotta take a boat. At some expense, I might add. We did the 4 hour morning trip, with a chance to swim with the dolphins, which I thought could be fun. Unfortunately NZ has a lot of rules about that, things like there can’t be a young dolphin in the pod, they have to be bottlenose, the number of people in the water can’t exceed the number of dolphins, and so on. I had my suit on but was not optimistic. Ginger was less enthusiastic – no way was she going into that cold water with fishy things bigger than her. As you can see, the morning was really overcast, but at least not raining. Well, that’s our boat. 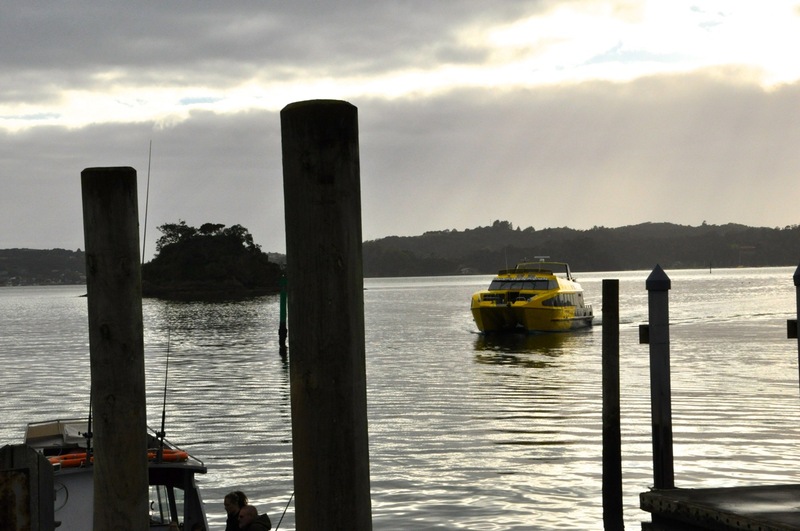 This is a major thing to do in NZ, and the tourists fill these boats pretty well. We’re off-season, but there are two major boat companies, each doing more than 2 trips a day, and our smaller boat still had about 50 people on it. There’s a bit of a jostle getting position to take a picture. Not our thing, really, but we’re giving it a go. There’s also a chance to see whales. Interestingly, orcas were seen the previous day, which meant for that day there were no porpoises to be seen. So we saw some islands. Not too exciting, really. There is some history involved. 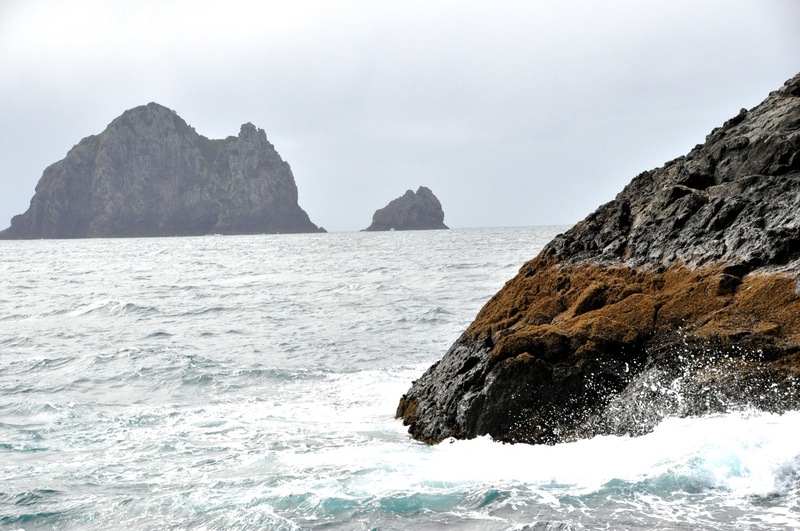 For example, the first picture is the cove where Cook stopped as he was mapping and naming features of NZ. nearby there is often a much much much more modest caretaker’s house – like the last picture – to keep the place clean and chase off the riff-raff. There are indeed many very pretty beaches on this Bay, all empty when we came by but which are apparently occupied in the summer (it’s still pretty chilly here). Here are a couple of interesting beaches. There’s actually a fair amount of interesting island scenery; jutting out crags, rock faces, shallow water of a different color, lonely lighthouses, etc. Examples below. Ah, the aquatic mammals we were supposed to see! Well, we did see them, but pretty shy ones. Photographing a dolphin or whale is not as easy as it sounds. They’re up, you point the camera and push the button to focus and snap, and you have captured the bubbles of their departure. And the rocking boat and jostling crowd do not help your success rate. Yes, we found a small pod of 4 dolphins, yes they were bottlenose, but yes, they had a younger one (we were told; I think there just would have been a small riot to allow only 3 people into the water). And whales? Well, a whale, but this whale was harder to photograph than dolphins. It briefly came up here and was gone, and you waited for forever, and it came up there and was gone. And like the dolphins, the whale was not in a joyous mood; no leaping out of the water frolicking, no tail flick, just a small gray hump appearing, rolling and gone. So here are my pictures of a whale, hard to get excited. who flew with us on most of the journey, hoping for a handout. Finally, the trip ends with a zip through “The Hole in the Rock”, that big chunk in the background. A tourist thing, I had an initial negative reaction, but in fact it was kinda neat. Here are the images of the funnel through the tunnel. The last image shows a much smaller boat coming through (yet another tour group). Well, that’s it for excitement. Really, we’re more into hiking than boating, and it’s cheaper! 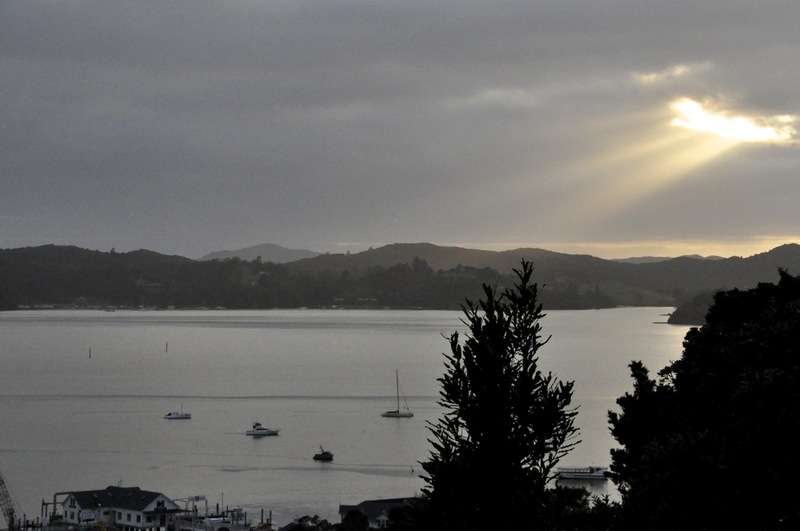 This entry was posted in Bay of Islands, New Zealand, North Island.